"Presto! No More Pests!" proclaimed a 1955 article introducing two new pesticides, "miracle-workers for the housewife and back-yard farmer." Easy to use, effective, and safe: who wouldn't love synthetic pesticides? Apparently most Americans did--and apparently still do. Why--in the face of dire warnings, rising expense, and declining effectiveness--do we cling to our chemicals? Michelle Mart wondered. Her book, a cultural history of pesticide use in postwar America, offers an answer. America's embrace of synthetic pesticides began when they burst on the scene during World War II and has held steady into the 21st century--for example, more than 90% of soybeans grown in the US in 2008 are Roundup Ready GMOs, dependent upon generous use of the herbicide glyphosate to control weeds. Mart investigates the attraction of pesticides, with their up-to-the-minute promise of modernity, sophisticated technology, and increased productivity--in short, their appeal to human dreams of controlling nature. She also considers how they reinforced Cold War assumptions of Western economic and material superiority. Though the publication of Rachel Carson's Silent Spring and the rise of environmentalism might have marked a turning point in Americans' faith in pesticides, statistics tell a different story. Pesticides, a Love Story recounts the campaign against DDT that famously ensued; but the book also shows where our notions of Silent Spring's revolutionary impact falter--where, in spite of a ban on DDT, farm use of pesticides in the United States more than doubled in the thirty years after the book was published. 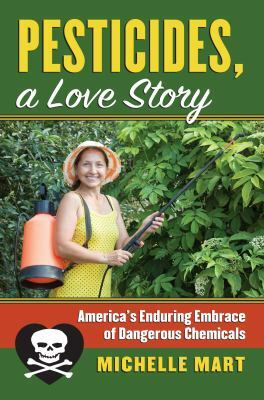 As a cultural survey of popular and political attitudes toward pesticides, Pesticides, a Love Story tries to make sense of this seeming paradox. At heart, it is an exploration of the story we tell ourselves about the costs and benefits of pesticides--and how corporations, government officials, ordinary citizens, and the press shape that story to reflect our ideals, interests, and emotions.